In GWAS the Bayesian Sparse Linear Mixed Model (BSLMM) is a hybrid of the LMM, which assumes all SNPs have an effect size drawn from a normal distribution (closer to ridge regression), and sparse regression which finds a few SNPs with non-zero effect sizes. In their paper on this model Zhou et al show that this hybrid method can have better prediction accuracy than either individual model on its own (which are special cases in their model), and can also estimate the proportion of variance explained by polygenic and sparse effects. However, when running this command I got one of two errors at either the Eigen-decomposition stage, or the UtX stage. ‘Segmentation fault’ or ‘Invalid instruction’. I’ve used the gemma static executable (the default download) before without any issues, so it looked to me like it was probably something with the linear algebra libraries. Tanglegrams are a visual method to compare two phylogenetic trees with the same set of tip labels. This can be useful for comparing trees produced by different methods on the same alignment, or on different alignments of the sample set. Tanglegrams work by connecting the matching tips of the trees, then rotating subtrees to minimise the number of crossings. The algorithm was published in 2011, and continues to be used in a range of publications (for example genomic epidemiology). pspA allele trees. Tanglegram between maximum likelihood tree and median from the Bayesian posterior. There is only one clade of swaps (near the bottom), so the trees must be similar? Not necessarily. A game I like to play is manually rotating subtrees to make metadata cluster. Though the topology remains identical, visually the clustering of metadata can change drastically. Even though we know vertical distance is meaningless in a phylogeny, the way this is usually visually displayed can lead us to draw erroneous conclusions. Rotating subtrees. Left: nice well defined clades clustering together. Right: same tree topology and labels, but the clades no longer form single clusters. Clusters 1 and 4 are polyphyletic, and rotating subtrees can break up or combine these vertically. Misleading tanglegram? This emphasises topology changes in more recent parts of the phylogeny (blue) and may be misleading about similarity of ancestral branches (red). The swap highlighted in blue is the only event where tip lines cross. This correctly leads us to identify that pspA-31 and pspA-37 are in slightly different places in this part of the phylogeny. However look in the red box. Those these strains totally align, the placement of them within the phylogeny is quite different (red arrows)! In this case I don’t think the line crossings by the tanglegram have identified what I wanted to see here, which is that the ancestral topology of these two trees is different. While I am not claiming tanglegrams are not useful, without careful attention they may be misleading. A good alternative to tanglegrams, in my opinion, is phylo.io. This allows you to dynamically compare two tree topologies, and see how each branch flip affects the arrangement rather than providing just one static comparison. If you want to try this out on the trees above the two newick files are attached at the end of this post to copy in. Finally, I would also note that there are various metrics which can provide a quantitative comparison between (many) trees, my favourite of which is the Kendall-Colijin metric implemented in treescape. plotTreeDiff result. The two trees, with tips coloured based on how many differences in recent common ancestors there are with other tips. You can use tipDiff() to see the numeric results direcly. Both the p-value from the Wald test, and the p-value from the new LRT are in the output. The LRT is expected to be a more powerful test in some situations. I would recommend its use over the Wald test. Testing has shown some clear cases (e.g. when population structure is not a major effect) where the Wald test performs poorly, and the LRT recovers the power of a chi-squared test. I have also put in a LRT for linear regression, but based on an estimate of the residual errors (which therefore gives slightly different results to R at small sample sizes). I don’t expect it to make much, if any, difference in this case. There’s a nice article on the Wald, LRT and score tests here. I’ll package this update in a future release, but if you want it now you can checkout the master branch and compile it yourself. This used 1063Mb RAM, took 1521s and used a maximum of around 75Gb tmp space on my home (as the /tmp drive on the cluster ran out of space). I was working on an OS X system which kept getting annoying pop-ups about the system needing clean up, anti-virus software etc. I was able to see that the window was titled ‘helperamc’. It turns out this was a remnant from Advanced Mac Cleaner, the use of which I won’t comment on here. The user of the system had tried to remove it when upgrading OS X version, but the annoying advertising component remained. As they are user files admin access is not needed. You may need to kill the helperamc process between these commands. A recent paper by Earle et. al. nicely showed the use of linear mixed models to determine drug resistance related genetic variants. Part of the software provided is an R package called bugwas, which will make the nice plots in figure 1 for you. You’ll need to use the author’s modified version of gemma, which can be downloaded here. This may not run on your system, due to the blas and lapack libraries being in unexpected places. You can easily solve this by making some symlinks. In my case this was libblas and liblapack. Find the libraries using ‘locate liblapack’ etc. Above, I have created symlinks to these in a location in my LD_LIBRARY_PATH variable ‘/nfs/users/nfs_j/jl11/software/lib’ (you can make a similar directory and export it using ‘export LD_LIBRARY_PATH=$LD_LIBRARY_PATH:<new directory>’). If you have a file readable into plink (stored as snps.bed, snps.bim and snps.fam) and bcftools, this is an easy conversion. As bugwas requires all sites to be imputed this code will take the major allele where any site is missing. An alternative would be to use the ancestral state, which the authors suggest using ClonalFrameML to do, though this will take longer to run. If you’ve got a messy vcf rather than a bed as input a script I wrote may help you with missing/multiallelic sites. You’ll need a phylogeny, which you can draw by standard methods (I’d recommend fasttree on your alignment if you’ve got > 1000 samples). If you’ve already got a tree make sure the tip labels match the samples in the gen file. I’ve found for around 2 000 samples and 110 000 snps I needed around 15Gb of RAM and 4-5 hours to run. I recently upgraded from OS X 10.10 to 10.11. This has upgraded the version of the gfortran dynamic library from 2 to 3 (in /Library/Frameworks/R.framework/Resources/lib), which in turn causes problems in various R packages (msm, ape). the solution seems to be to use install.packages recursively. Use it on the package that failed. If a dependency fails, use it on that too. Then restart R.
Some packages requiring compilation which link libgfortran (-lgfortran) fail, as the linker line does not give the correct directory through -L. I also have gfortran installed as part of gcc through homebrew, at /Users/john/homebrew/lib/gcc/4.9 (to do this, use ‘brew install gcc’). to the file ~/.R/Makevars. This should work, as long as when you load the library you have this directory either indexed through OS X’s equivalent of ldconfig (if there is one? ), or it is in LD_LIBRARY_PATH. PEER (probabilistic estimation of expression residuals) is a tool to determine hidden factors from expression data, for use in genetic association studies such as eQTL mapping. cmake -D CMAKE_INSTALL_PREFIX=~/software -D BUILD_PEERTOOL=1 ./.. Which will install peertool to ~/software/bin, which you can put on your path. Problem: I have genetic data at a single variant site, where the minor allele frequency (MAF) is set, and the prevalence of disease is known (Sr). The variant is truly associated with the phenotype, at an odds ratio (OR) I want to set. How do I simulate the phenotypes given these three parameters, and whether each sample has the variant (exposed) or not? Solution: As alluded to in one of the comments of the stack exchange post, but unfortunately not derived or written out in a formatted way, the number of disease cases is a quadratic equation which can be rewritten in terms of the above parameters. 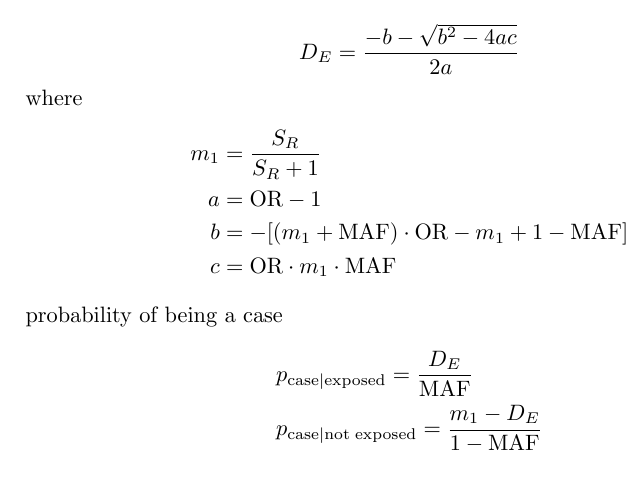 I found the derivation from the table of p11 (or De, number of disease cases that have the variant) in a book appendix.